Some people like to say that coffee is America’s favorite drug. Who are these people? I don’t know, but trust me they say it. Who doesn’t like waking up and injecting your body with a jolt of caffeine? Now if you love coffee and are reading this then you might already be rolling your eyes. For all intents and purposes, coffee isn’t that bad for you and people do just fine going their whole life drinking it. Problems start to occur though when you can’t go a day without having a good ol’ cup of Joe. In this post, we will be exploring the potential negative effects that coffee can have on you. Please don’t shoot the messenger. I just want to help build a better world with healthy and happy people. These points aren’t meant to get you to stop drinking coffee. If it’s part of your routine that you don’t want to give up then it’s part of your routine. These points are just mentioned to raise the awareness of what coffee can do to you. It’s not fair that I start off with this bombshell. Hydrochloric acid sounds pretty damn serious, right? The problem with hydrochloric acid is that it should only be produced by your body when digesting meals. However, if you drink coffee on an empty stomach your body will start to produce it with no food to digest. 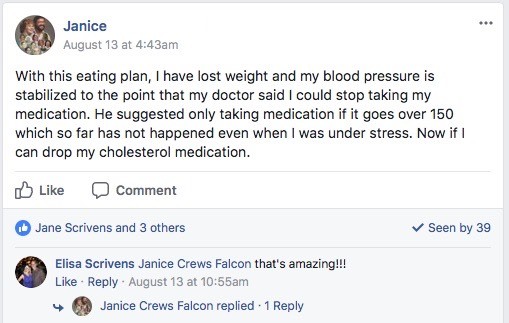 Because your body doesn’t have an unlimited supply of daily hydrochloric acid it’s quite possible that it won’t produce enough when you eat a large meal. Because there isn’t enough hydrochloric acid to break down protein-based foods, these foods can easily get into your small intestines. Quick biology lesson: You want to give your body every opportunity to break down protein-based foods because it acts as your body’s energy source. Undigested protein has been linked to a number of different health problems like bloating, gas, irritable bowel syndrome, diverticulitis, and even colon cancer. If you consider the fact that some experts believe that all diseases begin in the gut, then you can understand the problem that coffee and hydrochloric acid can cause. It’s a complete knock on effect of potentially 100s of different problems in your body. Just because coffee tastes good that doesn’t mean it doesn’t have some nasty things that can ruin your stomach. Caffeine and other various acids found in coffee beans can do work on the stomach lining and the lining of your small intestines. This is why patients with Chrohn’s disease, IBS, ulcers, and other ailments of the stomach are generally advised to stay away from coffee. The next question you have to ask (because you love coffee) is that whether or not coffee contributes to these ailments in the first place. Ulcers are believed to be caused by the Helicobacter pylori bacteria. I know, it’s crazy that it’s te 21st Century and we still aren’t sure about what causes ulcers. Coffee doesn’t contain this bacteria, but the acidic effect coffee has on the stomach may contribute to providing the weakened stomach lining necessary for H. pylori to take hold initially. In other words, coffee helps set up the perfect environment for this bacteria to flourish. Drinking coffee can also irritate the lining of the small intestine, potentially leading to abdominal spasms, cramps and elimination problems, often alternating between constipation and diarrhea. This condition is known as irritable bowel syndrome (IBS) and more and more people are being diagnosed with it in recent years. If you’re thinking about regular body ailments, heartburn ranks right up there as one of the most painful. What does coffee have to do with this? It all starts with the lower esophageal sphincter. This small muscle is what prevents what you put down your throat from coming back up. Nobody likes to throw up and one of those reasons why is because it burns. That’s the hydrochloric acid coming back up from your stomach into your esophagus. The cool esophageal sphincter helps to prevent that from happening. Unfortunately, coffee is known to relax the sphincter leading to heartburn and acid reflux. In fact, Coke and other high-caffeine energy drinks play a role in this as well. Almost seems like no drink is safe. I know people that like to drink coffee because it gets their “system started.” If you are having problems going to the bathroom then coffee can help, but the problem is when you consistently use coffee for this purpose. The process that our body goes through that makes us head to the bathroom is called peristalsis. Coffee stimulates that process. By stimulating it, people believe that coffee is doing them a favor by clearing out their system. The problem though is that coffee can trigger this process before your body is ready. It can push the stomach’s contents quickly into the small intestines before the digested food has been properly broken down. Because of this, it makes it harder for the body to get the proper nutrients absorbed from the food. Not much point in eating healthy if your body can’t get the most out of it. Sucking down that kale salad was a complete waste. Heavy coffee drinks have a difficult time absorbing the right minerals and nutrients into their bodies because coffee affects iron absorption in your stomach. It also hinders your kidney’s ability to retain calcium, zinc, magnesium and other important minerals. You obviously want as many healthy minerals in your body as possible, but preventing your body from properly absorbing magnesium can lead to big problems. Magnesium is used by your body to help with bowel regularity and it’s already a mineral that many of us are deficient in. I’m not going to lie to you about this one. This one isn’t proven, it’s just a theory. Coffee does a great job of keeping you wired, but this can also lead to extra stress and tension. Having your body and mind always on alert is not the greatest thing in the world. Sometimes you want your mind to relax and let go for a bit which can be hard when it’s fueled by coffee. If you can practice guided meditation in place of drinking coffee you’ll find that your stress levels and tension in your body is greatly reduced. Coffee is part of your daily routine. I get it. I’m not telling you to stop drinking coffee just like I wouldn’t expect you to tell me to stop breathing air. You might even be thinking that you’ll only stop drinking coffee when I can pry it from your cold, dead hands. However, if you are concerned with the negative effects talked about in this post then there is an awesome alternative for you. It’s called Teeccino. It has been produced with a much more similar taste to regular coffee. It is made of carob, chicory root, barley, dates, figs and dandelion with flavors like mocha, french roast and many others. What makes it so great is that it is alkaline instead of acidic like coffee. Remember all that that talk about ripping organ linings? That doesn’t happen with Teeccino. Because it all contains natural probiotics it is good for your digestive system as opposed to bad like coffee. If you’re curious about Teeccino and want to see if it can act as a coffee replacement for you then I would not suggest switching completely over to it right away. You should do this gradually. Grab a bag of Teeccino in whatever flavor looks appealing to you. On Day 1, make your coffee like usually, but only make two-thirds your regular amount. Teeccino takes care of the rest. On Day 2, half coffee and half Teeccino. On Day 3, one-third coffee and two-thirds Teeccino. On Day 4, 100% Teeccino. Most coffee drinkers should be able to follow this plan without any problems, but heavy coffee drinkers might go through caffeine withdrawals which are never fun. 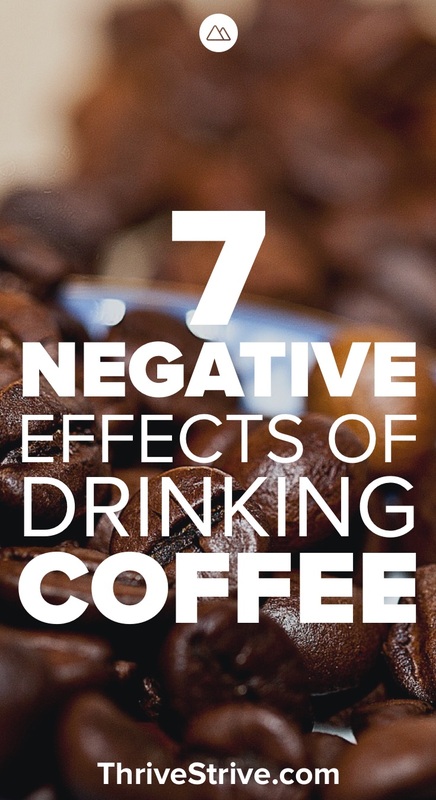 Enjoyed 7 Negative Effects of Drinking Coffee? 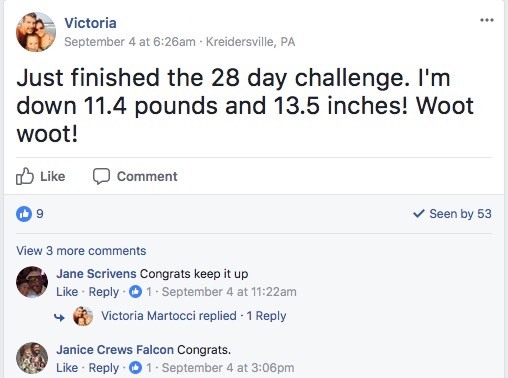 Share it with your friends so they to can follow the Thrive/Strive journey.